At McBride Financial Services, Inc., a Certified Financial Planner™ professional is always available to assist in acheiving your goals and objectives. A CFP® is a professional who renders investment advice and financial planning services to individuals, businesses and governments. They assist by helping the client maintain the desired balance of investment income, capital gains, and level of risk by using proper asset allocation. A CFP® practitiner may be able to utilize stock, bonds, mutual funds, real estate investment trusts (REITs), options, futures, notes, and different insurance productions to meet the needs and goals of their clients. Here are four reasons to work with a CFP®. 1. An advisor who has acquired this designation agrees to adhere to the CFP® Board's code of ethics and meet their experience and education requirements. At McBride Financial Services, Inc., we have both CFP® and CPA designations. 2. 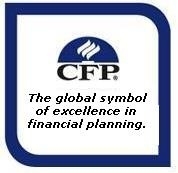 An advisor who has been a CFP® practitioner since 1988 has withstood the test of time. They say that the passing of time can shake out the unworthy ones. If your CFP® advisor has managed to stay in the industry for a long time, then it's an indication of their credibility. 3. The service a CFP® offers depends on a number of factors including credentials, licenses and areas of specialty. Generally, a CFP® practitioner cannot help you implement insurance or securities products such as mutual funds or stocks without the proper licenses, or give investment advice unless registered with state or Federal authorities. We are securities and insurance licensed and MFS is an Arizona licensed investment advisor. a. Fees based on an hourly rate, a flat rate, or on a percentage of your assets being managed. b. Commissions paid by a third party from the products implemented by you to carry out the financial planning recommendations. Commissions are usually a percentage of the amount you invest. c. A combination of fees and commissions whereby fees are charged for the amount of work done to develop financial planning recommendations and commissions are received from implemented investments. In addition, some planners may offset some portion of the fees you pay if they receive commissions for carrying out their recommendations. We may be paid via fees and/or commissions.